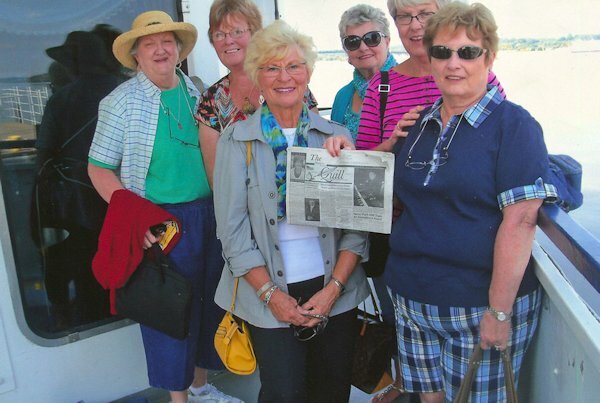 On September 25-27th, six classmates who graduated in 1960 from Stronghurst High School enjoyed their annual get together at the Radisson in Moline. A beautiful fall weekend was enjoyed by taking a luncheon cruise on the Celebration Bell on the Mississippi, plus shopping and taking in the John Deere Commons. Friday evening was spent at Circa 21, seeing "You're too Young to be a Grandma." Those attending: front to back were Vicki Arthur Johnson from Peoria, Millie White Irwin, Allegan, MI, Jerilyn Wetterling Powers, Libertyville, Carole Veech Dillon, Stronghurst, Marilyn Nolen Frank, Aledo, and Margie Boyd Knirlberger, Mt. Carroll. A good time was had by all. When you go on a trip, take "The Quill" along, take your picture with it, and send it to us. Let's see where all "The Quill" can travel.